As part of my ongoing engine breaking-in I had an 80 mile round trip ride out today to this place https://goo.gl/Ri3J7G where I sat out at a pavement table for a Cream Tea. Burford is a tourist magnet. Me and the bike will be appearing in a few Japanese holiday snaps! The bike is going really well! Possibly slight tappet rattle when really hot but things settle down and need adjusting after any strip, don't they. The only oil leak appears to be from the flippin oil tank filter & outlet plug. When I drain the tank for the engine's, (is that apostrophe correct?) 500 mile oil change I'll put new fibre washers on it! While the engine was stripped I put a new oil check ball and spring in, (seating the ball with some light tapping). Today I thought I'd take the sump plug out to check for wet sumping. About a 1/4 pint of oil came out; about the same as ever came out of this engine after a rest of a couple of days. So, the new parts do not seem to have made any difference. Poo! Gee you have some beautiful towns over there. I see Google maps street view has improved, even getting inside a few shops. 1/4 pint is about right. That's the amount of oil splashing around in there when running. I often say I really love Britain. When we've been abroad, to say a Greek beach holiday, as the plane flies over the UK landscape the green is fantastic! We only have a tiny country; compared to Australia or America. It must appear rather park-like to visitors. As a relatively newbie to GF, is this a common problem “tapped rattle” when the engine is hot or is an indicator that adjustments are required. I've mostly found on alloy heads that the tappets get quieter when hot as the gap closes up and if set too tight/close they can prop the valves open when really hot. I'd say the iron heads aren't as prone. If the noise is very bad when hot it could be a loose guide. That mixed up quote amused me. It's probably something to do with the Greek food! Thanks Muskrat, I’m on a run this weekend and hopefully when back will check over. My dad always said if it’s not broken don’t fix it son...man of few word but very enlightened! Greybeard, for an easy check of wetsump rate remove the drain plug , drain off the initial amount then place a clean empty container below the drain for a set period, say 12 hrs or 24 hrs. Measure how much ( if any) oil collects. Hopefully it will be a tiny amount. ...but the comma is not. Rocker arm and pushrods are a compromise for heat and expansion so some models in a very general sense are quite noisy on start up, but all should quiet down once heated. Cast iron top ends have a much different tone to them from bit clanking around. Many years ago built a Norton Atlas for a young guy who never had a British bike before,,, We had to make a few exceptions due to his budget, But he was generally pleased but there was a long road of education with him on BritBike ownership. He took delivery when it was still warm and test road it, showed him how to start it properly etc.. 2 days later calls and said its not circulating oil and coming apart. (Panic on my part) I rode to his house and nothing wrong with it. Spent half a day showing him how it all worked. (But is it SUPPOSED to make those noises??). He complained about vibration as well,,, which was funny AND annoying because YES,, Norton Atlases are known for shaking and vibration,,, But that was one SMOOTH Atlas because I had blueprinted and dynamically balanced the engine. So compared to most it was exceptionally smooth. He finally shut up about it (Sometimes it take a 3rd party to put things in perspective) And I found out that he had taken the bike to another Norton owner and asked for his feedback. The other guy let him ride another Atlas and that was the last complaint I ever got and the other guy approached me later and told me what a good job we had done on the bike and had told that kid so. A) A seasoned & experienced owner who has had them before, only needs a little coaching and is good to go. Hey Sluggo, I'm a B+, do I pass?? Give me some Karma people! I enjoy paying it fwd to those who appreciate the gesture. Had a guy out this weekend, 69 yrs old spitting image of R.Lee Emery (my wife said he doesnt look 69) and he had his grandson limping around with him. The kid wrecked race bikes 2x recently but is showing great promise on the track. They are putting together some vintage flat trackers and was a very fortuitous meeting as we have some projects I think we will be collaborating on soon. But the old guy kept ribbing the kid saying "See??? Look at all this stuff! He has way more than me!" because apparently the kid thought the his grandfather had too much old stuff piled up (Except when he wants to race it of course). What they were excited about is I have a bunch of stuff from an old race shop and fabricator.. Im keeping some for some street tracker projects, but some I am selling. Some I needed to ID so got some help there as well. I will add a quick comment that warmed my cockles.. We were looking at my 56 Goldstar, and the old man told the kid "Remember when you were a little kid and we took you to Dinosoar daze and that BSA that made your chest thump from the exhaust when he rode by our camp site?? 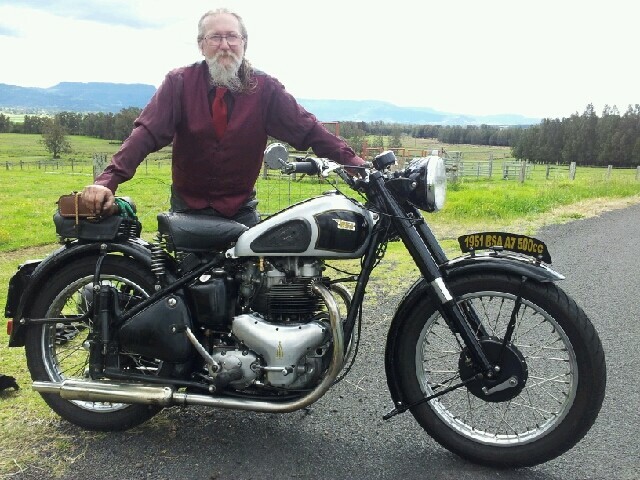 This is the same bike, Its a BSA Goldstar!" The kid was about 6 or 7 at the time & he told me was freaked out by a Goldie but fascinated as well and said...."I WANT ONE!" So, This guy here, Famous Ray,, (Just found this picture of him and YES,, he pulled out of that slide) Got some custom race frames and parts he was famous for. Page created in 1.374 seconds with 26 queries.